We are very busy with an active situation in the Washington, DC area. I have sent an Alert email to all of my clients and colleagues that could be affected. If you are in the Washington, DC area and I can verify that you are in the industry I will pass along the intel in order to assist you and your client. 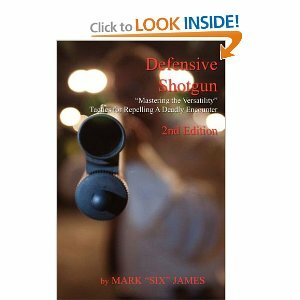 Today’s blog is an endorsement of Mark “Six” James’ book, Defensive Shotgun, “Mastering the Versatility” Tactics for repelling a deadly encounter. I received the book as a gift about 3 months ago and began reading it immediately. I had to fit the reading between work and other responsibilities and finished it last week. In a time that it appears that the formidable shotgun has been replaced by the M-4, Mark’s book reminded me of how important the shotgun was to me as a Maryland State Trooper. After reading the book I can honestly say that it made me put my Mossburg bullpup back into rotation for my range days. The book is extremely thorough and complete with every aspect of the shotgun platform. Mark has carefully included great pictures to illustrate every aspect of the book. This is the 2nd Edition of the book and it can be ordered through Amazon for $19.95 – HERE. Just last week I recommended the book to a friend who was in the market to purchase his first shotgun as a home defense weapon for his new home in the Virginia mountains. Chapters in the book include [but not limited to]: Getting started, types of shotguns, Carry positions, shotgun reloading and one hand operation etc. Mark is the President of Panther Protection Services, Atlanta, GA. He is widely viewed as an expert in the industry and is a regular contributor and administrator on the Facebook NABA forum. I own a copy of Mark’s book (signed copy in fact), and thought it was informative and presented the subject manner in a way that was accessible to a broad spectrum of readership. My hat goes off to individuals that can both do the work actively on a consistent basis, and still create the time to produce a well presented educational tool.